This quick stew is hearty and warming – perfect for a cold winter’s day. To prepare the beans, cover in cold water and soak overnight. Strain and wash in fresh cold water and then place in a large pan. Cover with more fresh cold water and bring to the boil over a medium heat. Cook for about 40-45 minutes or until tender. Drain thoroughly and set aside. Warm the oil in a large pan over a medium heat. Add the onion and the chilli and cook for 5 minutes or until softened. Add the ginger and cook for a further 5 minutes. Add the harissa to the pan, to taste, followed by the apricot pieces, mixing them well. Stir in the cherry tomatoes and the beans and return to the heat, uncovered, for a further 5 minutes, or until piping hot. Season generously and serve with dollops of Greek yogurt, fresh coriander, couscous, rice or tortillas. 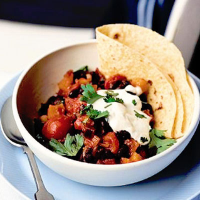 To save time, use tinned black-eyed beans, drain and rinse and add at step 4.